Roberto Firmino has been desperately close to making this list so many seasons in a row and now has finally cracked our end of season Top 100 list for the first time! The Brazilian forward has been so consistently stellar for Liverpool this season, just providing Liverpool with something different that nobody else in the team can do. Mane and Coutinho both spent lengthy periods out with injury this season but Firmino was always fit, coming up with some massive performances for the Reds and becoming one of the first names on the team sheet. The 25-year old striker scored 11 goals this season in 35 Premier League appearances. But it’s not just about the goals. Firmino also creates them, adding a solid tally of 7 assists and impressively creating 77 chances over the course of the season. His work ethic is phenomenal and he even helps out massively in defense, making nearly 2 tackles per game. He offers Jurgen Klopp a different look, does so much for the team and it is no wonder why he continues to keep Daniel Sturridge and Divock Origi out of the side. Formula Score: 85.24. Cesc Fabregas lost his place in Antonio Conte’s XI in 2016-17, but was still fantastic in every single game he played and finished as the club’s leader in assists with 12! 5 goals and 12 assists from 29 matches and only 13 starts is absolutely immaculate and just shows how much quality Chelsea have up and down the pitch in all areas of the game. What was also amazing to see was how much of a positive attitude the Spanish midfielder had towards his team and his coach despite only starting a third of their matches. He never sulked and instead always remained so positive, letting his football on the pitch do the talking. Fabregas is still one of the best midfielders in the world, could walk into any club, and if only he was a starter for Conte’s side, would easily be in the top fifty on this list. Formula Score: 85.24. Similarly to Cesc Fabregas above, James Rodriguez has not been given enough of a chance to truly show how good of a footballer he is. If he had been able to start week in and week out, we can’t help but believe the Colombian international would have been right up in that top twenty. Unfortunately for James, the balance of the team just needs to be right and Luka Modric’s fantastic partnership with Toni Kroos is never going to be broken. That leaves only one spot open in midfield and Zidane has always opted to go with the defensive-minded Casemiro to allow Kroos and Modric to roam further forward. Strangely as well it was Isco who was coming into the team instead of him when Gareth Bale wasn’t fit. So the fact that he is that far back in the pecking order means he cannot possibly be considered one of the forty or fifty best footballers in the world right now as good as he is for both club and country when he’s been given the chance. In 2016-17, James Rodriguez had another decent season with Los Blancos though, scoring 8 goals with 6 assists in just 22 appearances. This is a pretty remarkable tally given how much time he has had to spend on the bench but the sheer connection he has had with the bench in the previous two seasons is what sees his low ranking on this list yet again. Formula Score: 85.28. Kylian Mbappe-Lottin might be better as an eighteen year old than any other teenage phenom who has come before him. The Monaco man dominated both legs against Dortmund, tore up Manchester City and was this season’s UEFA Champions League surprise star on top of tearing up Ligue 1 week in, week out in the process. Pace, power, verve and bundles of energy, Mbappe-Lottin is absolutely impossible to stop when he’s in full flow and he proved to be more than capable at scoring with both feet and finishing off all kinds of chances with his play across Europe in 2016-17. But it’s not just as though the Frenchman scored a few goals in a few big matches, like Renato Sanches did back in Euro 2016, he scored 15 goals with 8 assists in in just 29 Ligue 1 matches, only 17 which were starts. He was one of the main reasons why Monaco were able to win Ligue 1 this season in such shocking circumstances and even more impressively make it to the semi-finals of the UEFA Champions League, the tournament in which he scored 6 goals in 6 starts. Kylian Mbappe-Lottin might be one of the best teenage phenoms of all time in sport and if he continues to polish up his game, could soon become one of the very best strikers on the planet. Formula Score: 85.39. Radamel Falcao is well and truly back to his best again. The Colombian forward had a torrid time in England with both Manchester United and Chelsea but returned to his uncontrollable goal-scoring self again with AS Monaco this season. Falcao was magnificent for Leonardo Jardim’s side, helping lead their charge to the Champions League’s semi-finals and even a Ligue 1 title. With all the rising stars in the team such as the likes of Mbappe, Lemar, Silva, Bakayogo and Fabinho, many forgot about just how important Falcao was to the team and he often went a bit overlooked. His work ethic was incredible and it culminated in the Colombian netting 28 goals in just 41 appearances in all competitions this season. That included 21 goals with 5 assists in 29 Ligue 1 appearances and 5 goals in just 8 UEFA Champions League matches, helping lead Monaco’s charge the whole way through. Obviously it was always going to take time to recover from such a torrid ACL injury but you just can’t help but wonder what Falcao would have achieved had he stayed with AS Monaco the last two seasons. Formula Score: 85.44. Alex Sandro this season has established himself as one of the best fullbacks in the world of football. At many points and times this season, he was on par with what Dani Alves was doing for Juventus; bombing down the flank and delivering balls into the box before racing all the way back to help defend. Sandro and Alves did that sort of thing better than any other fullback-pairing this season and it was such a large part of what made the club tick. In 27 Serie A matches this season, the 26-year old left-back scored 3 goals with 4 assists; creating nearly 2 chances per game and making more than 2 tackles per game. The Brazilian defender was also one of Juve’s best players in the UEFA Champions League, featuring in 11 matches as the club made it all the way to the final. He really is just a wonderful footballer with so much quality and the way he has used Juventus as a platform to establish himself as one of the best defenders in world football has been fantastic to see. Formula Score: 85.54. Edin Dzeko is back to his best, scoring for fun in Serie A and leading the league in goals with 29 in 37 appearances. Dzeko was just instrumental for Roma this season, in every single competition they played in. The Boznian gave everything he had for his side in every single match and was more than just a goal-scoring target man, coming up with 9 assists in Serie A alone! Moreover, the Boznian carried his positive form over to every other competition, scoring 8 goals in 8 UEFA Europa League matches, 2 goals in 4 Coppa Italia appearances and 3 goals in 4 FIFA World Cup Qualifying games. Edin Dzeko really does have the quality to be a world class striker who could fit into every club around the world. Manchester City should never have let him go given what massive feats he achieved this season. Edin Dzeko is now back to being known around the world as one of the very best centre forwards on the planet. Formula Score: 85.62. Christian Eriksen might be one of the most underrated footballers in the world at the moment. His role in Tottenham’s team is absolutely vital to the way they play yet he never receives the same amount of credit as half the team. Eriksen is one of Europe’s most creative outfielders, assisting 15 goals in league play alone this season. Only Kevin de Bruyne (18) achieved more assists than the Danish international in the Premier League this season, but Eriksen topped it up even more with 8 goals! The Danish midfielder was probably nowhere near making the PFA Team of the Year which really is such a dissapointment given how effective he was for Spurs this season. No matter the competition, Eriksen was often Tottenham Hotspur’s best player this season and they would not be the same outfit without him. Formula Score: 85.62. A wonderfully decorated footballer, Javier Mascherano has not had his best season of his career. To be perfectly honest, very few Barcelona players have. But his role in Barcelona’s back-line was nowhere near as solid and critical as it has been in recent seasons. The Argentinean defender made 25 appearances this season in Spain, scoring 1 goal with 3 assists, but he wasn’t always first choice and struggled to be even as consistent as Umtiti and Pique. 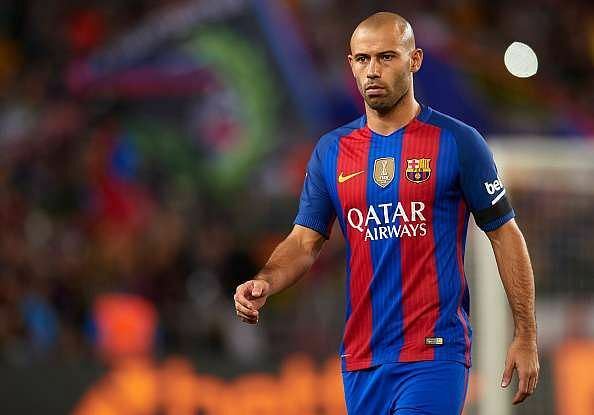 He is 33-years of age now, so it was always natural for a decline to occur, but Javier Mascherano needs to show the kind of form he usually exhibits on the regular for Argentina when he’s playing with Barcelona too. Formula Score: 85.62. David Luiz has easily been the best defender in the Premier League this season. He was just so improved from the last time he was at club and never put a foot wrong after Antonio Conte moved to a back-three. He was confident, he was poised, he never made any defensive mistakes and his role in attack was even at times instrumental. Playing the role of the sweeper, the Brazilian acted as the last line of defense for Conte’s side in 2016-17, always making sure to clean up the mess and only conceding just six yellow-card worthy fouls. Making 33 appearances this season for the Blues and scoring 1 stunning free kick, he was one of the first names on the team sheet every single game and was pivotal to helping Conte’s side win the title. David Luiz has truly re-branded himself as one of the world’s finest defenders again and if he can keep up the same kind of form next season, he will skyrocket up the list all the more. Formula Score: 85.67. For a long time, Filipe Luis has been one of the most underrated defenders in the world. He’s arguably Atletico Madrid’s most important player when at his best and few other fullbacks in the world do what he does in both attack and defense. The Atletico left-back made 34 La Liga appearances, scoring 3 goals with 6 assists and making 3.5 tackles per game! So key in all areas of the pitch, Luis role in the side cannot be understated and in a league with left-defenders like Marcelo and Alba, the 31-year old still made 12 La Liga Team of the Week appearances! That was more Mastermind TOTW apps than any other defender in history and made Luis a massive asset for Atletico in helping them cruise to a third place finish. Filipe Luis was also brilliant in the Champions League as always, making 10 appearances, assisting 1 goal and completing 3.2 tackles per game on his way to helping Atletico to the semi-finals. Filipe Luis is for my mind one of the three best left-backs in the world behind only Marcelo and Alaba. His role in Diego Simeone’s team cannot be ignored and they likely would not be the same well-oiled machine without him. Formula Score: 85.70. Obviously one of the best defenders in world football on his day, Jerome Boateng just could not stay fit this season and his ranking on this countdown suffers as a result. After a great time at Euro 2016, Boateng only made 13 Bundesliga appearances this season and he really struggled with his fitness in the vast majority of them, averaging 63 minutes per game and never reaching his best. We all know Jerome Boateng has quality of the highest order and can be one of the best defenders in the world on his day. But his formula score has suffered massively with how much he’s been out injured and because he hasn’t truly stepped up to the plate when he’s been fit this season in any competition at all. Formula Score: 85.70.
Who would have expected Ousmane Dembele to have this big of an impact for Borussia Dortmund this season? He’s only 20 years old but was at times Thomas Tuchel’s most important player! Dembele’s unbelievable passion for the game has been one of the most impressive things to watch about the youngster this season. The Frenchman just has such a great appetite for football and wants to perform to his best in every single game he plays. He doesn’t settle for mediocrity and on the rare occasion when he hasn’t assisted or scored a goal in a match, he’ll do everything in his power to do so. Whenever Borussia Dortmund have been struggling this season, it’s been Dembele, the man who was 19-years old for almost the entire season. The French footballer completed 3.2 dribbles per game for Dortmund this season, the most in the Bundesliga by quite some distance. He’s got footwork and dribbling skills that could give Neymar and Eden Hazard a run and it culminated in him getting away for 12 stunning assists in league play alone. 6 goals and 12 assists was what Dembele ended with in 32 Bundesliga appearances this season (only 22 starts), a highly impressive tally for a 19/20 year-old playing in one of the best leagues in the world. His form was also phenomenal in the UEFA Champions League, scoring 2 goals with 6 assists in 10 matches! A Dortmund legend in the making, the versatile play-maker has quite the future ahead of him. If at the age of 19 he can keep established footballers with tremendous quality like Shinji Kagawa, Andre Schurrle and Mario Gotze out of the lineup, then who knows what he can accomplish later in his footballing career. Barcelona, Real Madrid and Manchester United should all come calling next season, but with a good head on his shoulders, Ousmane Dembele will likely reject the offers, stay in Dortmund and continue to tear up the Bundesliga. Formula Score: 85.82. After a 2015-16 season that just seemed to be poor performance after poor performance, Thibaut Courtois has been arguably the best goalkeeper in the Premier League this time around. Hugo Lloris might have earned more plaudits while David De Gea might have secured the nod in goal in the PFA Team of the Year, but Courtois definitely has just been so key to Chelsea’s defence this season and really looked back to his best. Some of the saves he pulled off were incredible, while 16 clean sheets from 36 matches was not a bad tally either. He also only conceded 0.78 goals per game while his 2.15 saves per goal conceded was also an impressive feat; one of the most impressive in the league in fact. After years of being thought of as just the second or third best goalkeeper in the league behind De Gea and sometimes Lloris, Courtois might just have eclipsed both with his play in the Premier League this season. Formula Score: 85.83. A key member of Chelsea’s incredible back three, Cesar Azpilicueta was arguably better than any other defender in the Premier League this season. Adapting to his new role as a centre half so incredibly well, Azpilicueta never put a foot wrong and illustrated exactly why he is one of the best in the world at 1v1 situations. Azpilicueta has starred at centre back, a new position to him, and was the only Chelsea player to play every single minute of every single game of the league season. In every area of the game the Spanish defender was excellent, particularly his passing where he created 23 chances, achieved 4 assists, made 2,459 passes and successfully completing 114 long passes! On top of that he was also been superb in defense, always winning individual battles, completing 2.1 tackles per game and making 2 interceptions per game as the Blues kept 16 clean sheets. Cesar Azpilicueta has had a magnificent season, adjusting to his new role as a centre half wonderfully well, continues to be so underrated at the back for the Blues and absolutely deserves to be thought as one of the best defenders on the planet. Formula Score: 85.83. Koke appears in every single match that Atletico Madrid play. He is such a favourite of Diego Simeone and the Atletico fans and is normally their most creative outfielder. But this season, Koke didn’t reach quite the same heights as he has in the two previous seasons. 4 goals and 8 assists from 36 La Liga appearances was still a great tally for a player primarily being deployed as a central midfielder but it was not up to his normal standards. His form in the UEFA Champions League was also not up to the same standard as the Spanish midfielder assisted just 1 goal in 12 appearances. But Koke is easily one of Atletico’s most important players and one of the best midfielders in the world. He does so much for the side in both attack and defense and really should be given more of a chance to shine for the Spanish National Team as well. Formula Score: 86.15. It wasn’t a great season for Barcelona in comparison to others but Pique was often the club’s most consistent defender. Pique scored 2 goals in 25 La Liga appearances and added 1 goal in 8 UEFA Champions League appearances, while continuing to be one of the best passers at the club. It is unfortunate that it was just such a lackluster season for Barcelona and that they crashed out of the Champions League so early on. But the Spaniard was however crucial to Luis Enrique’s team in helping them win the Copa del Rey, making 7 appearances. Gerard Pique is one of the best defenders of his generation but he needed to show that on a more regular basis this season. Formula Score: 86.16. As he continues to develop into one of the five best goalkeepers in the world of football, Hugo Lloris has just had his best season of his entire career. The French goalkeeper was so crucial to Tottenham this year, making more saves per goal (2.78) than any other starting keeper in the league and keeping 15 clean sheets in 34 matches. Lloris came up with some massively important saves for the club as well, helping him only concede 0.71 goals per game. 30-years old now, Hugo Lloris has matured into one of the best goalkeepers in world football and still has many more great years ahead of him. Formula Score: 86.24. Gabriel Jesus was more important to Manchester City from January to May than any other January signing in world football yet he spent three months out with a broken foot. He only even made 10 Premier League appearances, but incredibly still bagged 7 goals with 4 assists. The versatile 20-year old was so important and so clinical in front of goal that he even stole Sergio Aguero’s place in the side for a while there. His work ethic, energy and form in front of goal were all amazing and made him one of the most deadly and dangerous strikers in the league. No one could cope with him and next season really could be a massive year for Gabriel Jesus as he could be set to elevate himself all the way up into the top forty. Formula Score: 86.21. So consistently solid every single game and almost effortless in his play, Toby Alderweireld might have gone underrated for his play this season. With the quality of Chelsea’s defense, the big Belgian might have gone overlooked at times this season and would walk into many people’s Team of the Year. He featured in 30 Premier League matches this season, not making a single mistake and always impressing with his incredible passing range. At times he acted as a quarterback for Spurs, launching the ball forward from long distances and getting Spurs going in attack. Always a beast in defense, Alderweireld formed such an impressive partnership with Jan Vertonghen this season and the duo might be one of the best defensive pairings in the world. Formula Score: 86.29. Make sure to check out all the other big reveals. See you soon and happy reading!